In order to understand how layers work in website builder WebWave, let's imagine a sandwich with ham and cheese. If we put cheese on the ham, we'll be able to see ham through the cheese holes, but if we put ham on the cheese, we won't be able to see cheese. It works exactly the same in layers. The higher on layers list, the more elements will it cover. When you add a new element, website builder WebWave automatically generates its layer. When you select the element, you select the layer and vice versa. What's also important, deleting the element deletes the layer. Default layers names can be misleading, but in WebWave website builder you can freely change them. 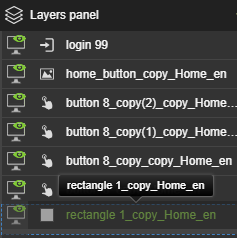 In order to do it, double click on the name on layers list and enter a new one. It is a good practice to match layers names with its functionalities, for example, "offer content", "image of a grumpy cat" or "main menu". To change layers order, drag a layer and drop it in a new place on the list. 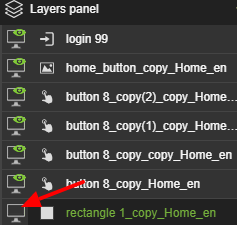 In order to hide a layer (and the element), go to the Layers panel and click on the green eye icon. The eye will disappear just like the element on a website. 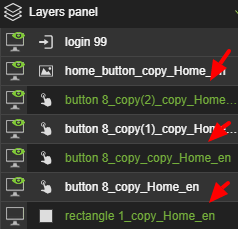 To select many layers, press Ctrl and click on them. If you want to select layers in a certain interval, select a first one, press Shift and select the last one. All in between will get marked.